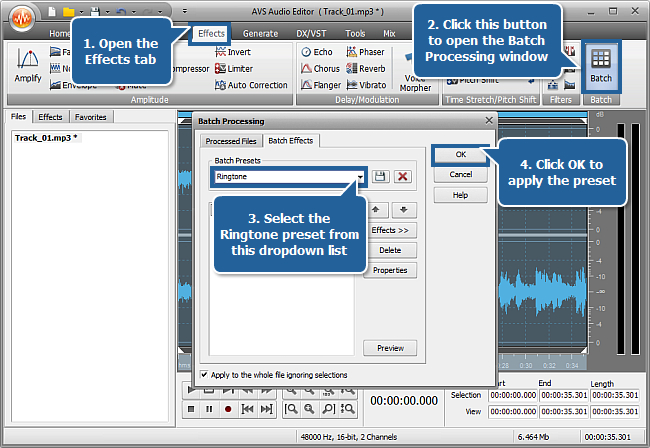 How to create a ringtone with AVS Audio Editor? The majority of mobile phones supports mp3 files playback over stereo-headsets and built-in loudspeakers. Audio tracks in mp3 format can be listened on headphones in quite a high quality, but if you try to use them as ring tones the sound won't be good enough. 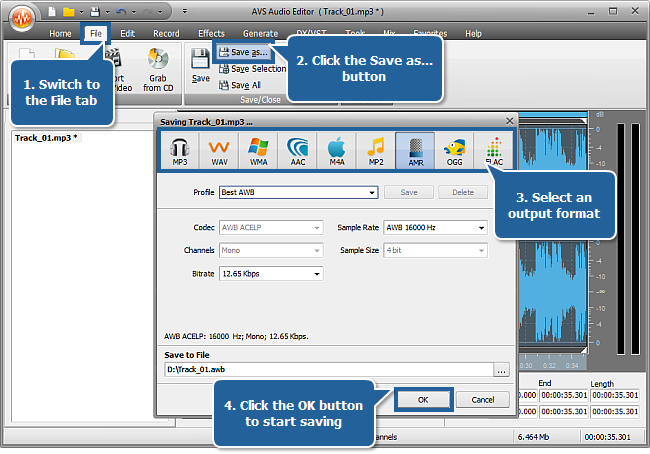 You can easily solve this problem and enhance sound reproduction using AVS Audio Editor. Your audio will be optimized for the playback over your mobile phone loudspeaker. Please follow the steps below. 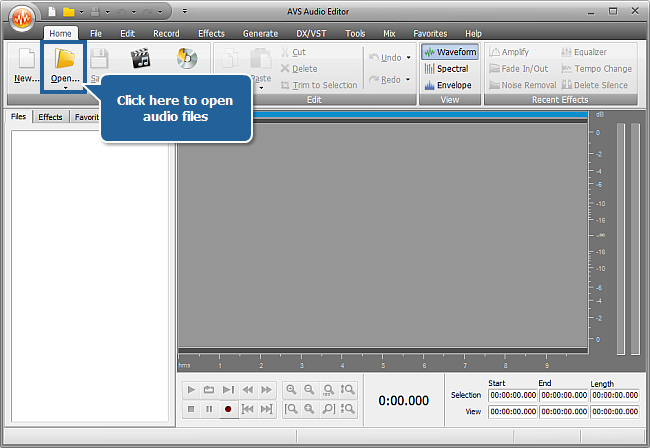 To open an audio file that you are going to edit click the Open button on the Home tab of the Ribbon Command Bar. 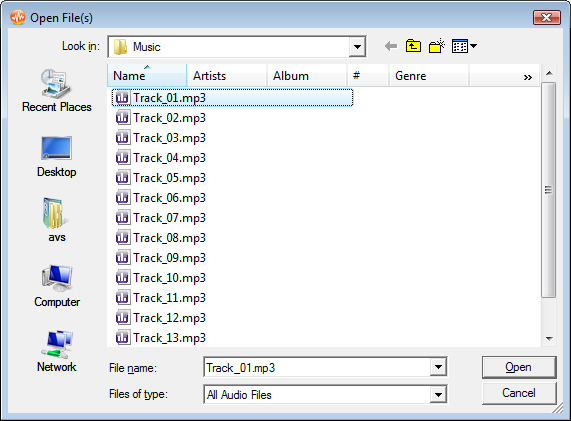 In the opened Windows Explorer window browse for the necessary audio file and press Open. To find the precise segment which you would like to use as a ringtone switch to the Edit tab. Click within the Waveform Display and without releasing the left mouse button move it until the position where the required fragment ends. Note: to select the required part more precisely you can use the Zoom in button and the player buttons at the bottom of the program window. For more convenience you can previously indicate the start and finish points of your selection with markers by clicking the required position with the left mouse button and pressing the Add marker button. As soon as the desired fragment is selected press the Trim to Selection button from the Edit Operations button group on the Ribbon Command Bar. All the audio will be deleted except the selected fragment. 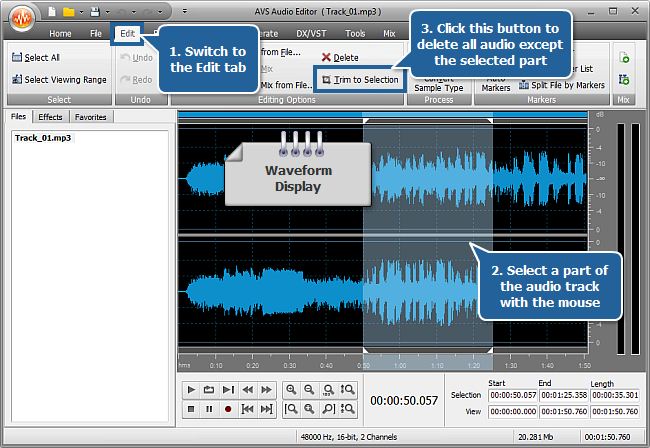 The remaining part will be displayed in the waveform editing area. If you need to delete some more fragments select them with the mouse and press the Delete button. To make sure that you have received the part that is actually needed, playback the fragment using the player buttons at the bottom of the program window. If you are not satisfied with the result use the Undo button to cancel the last editing operation. Go to the Effects tab and press the Batch button on the Ribbon Command Bar. The Batch Processing window will appear. Select the Ringtone preset from the Batch Presets dropdown list. Switch to the Processed Files tab of this window and make sure that your file is checked in the list. Press the OK button to apply the preset. Switch to the File tab and press the Save as... button. The Saving window will be opened. Press the button corresponding to the format which is supported by your mobile phone (consult your mobile device documentation to find it out). Select one of the presets from the Profile dropdown list or set the needed format parameters manually. Set an output file name and select the location for your resulting file using the Save to File field. Press the OK button to start saving. As soon as the process is over the confirmation window will appear. Connect your mobile phone to your computer using USB, Infrared or Bluetooth connection. Switch on your mobile. Open the destination folder which contains your saved ringtone. 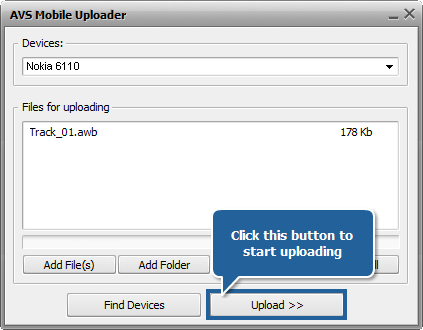 Right-click the resulting file and select "Send To" – "AVS Mobile Uploader" from the appeared menu. The AVS Mobile Uploader application will be launched. If your mobile phone is not displayed in the application window press the Find Devices button. Click the Upload>> button to start uploading. Wait a few moments while the application transfers the ringtone to your mobile phone. That's all! Set your own ringtone for incoming calls and enjoy its excellent sound quality.